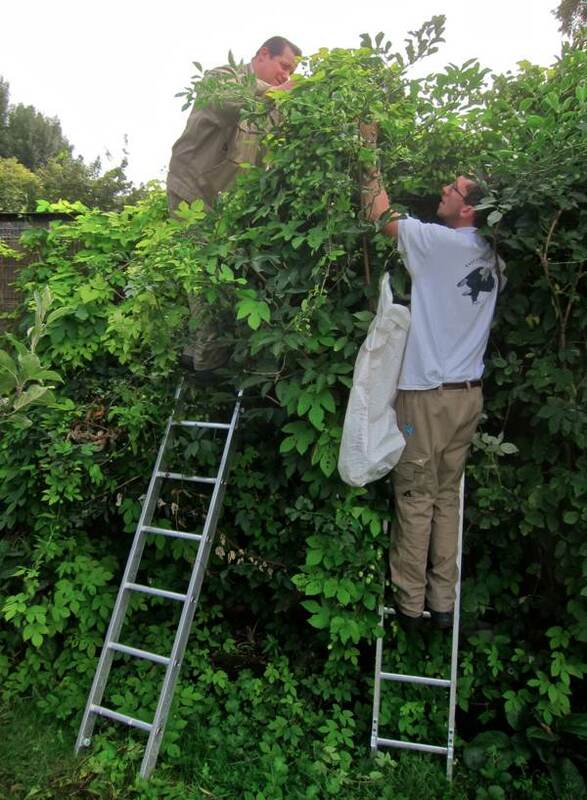 For years, hops have flourished at Spitalfields City Farm in Buxton St, next to Allen Gardens where dray horses from the old Truman’s Brewery once grazed. 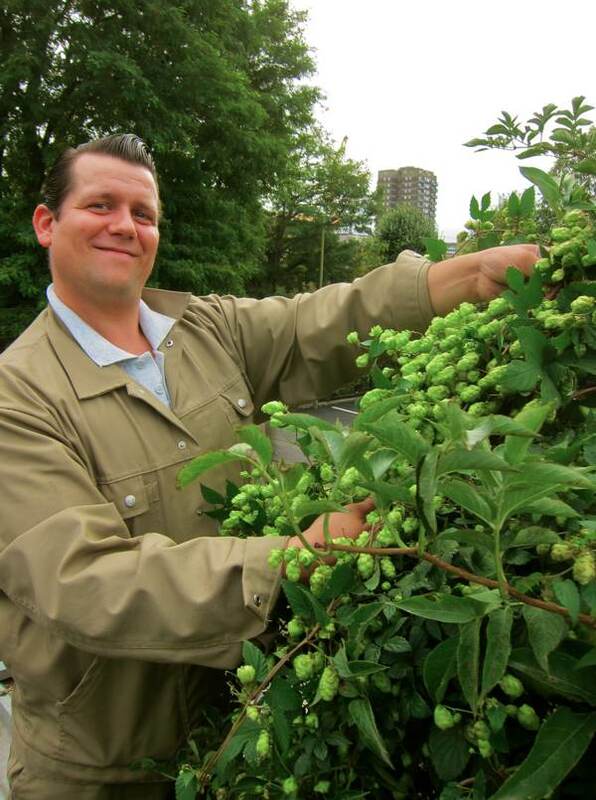 Thus it is assumed that these plants seeded themselves and owe their origin to Truman’s, which makes it especially appropriate that Ben Ott, Master Brewer at the new Truman’s Brewery should harvest them. 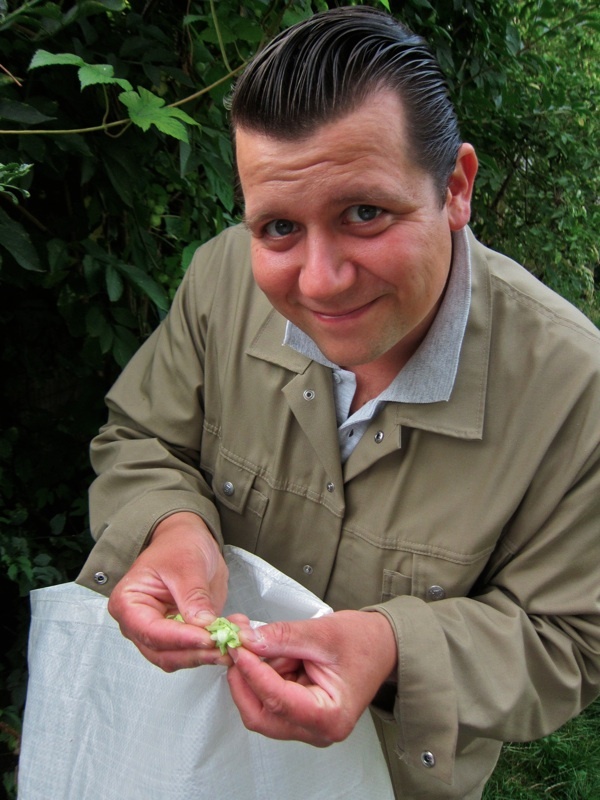 Commercially-grown hops are dried in a kiln shortly after picking to preserve their essential oils and Ben split one of the flowers open to show the delicate yellow pollen, known as ‘lupolin’ which contains its flavour and aroma. Casting our eyes over the hop bines spread along the hedge at the City Farm, we had hopes of picking several sacks of flowers in a morning. 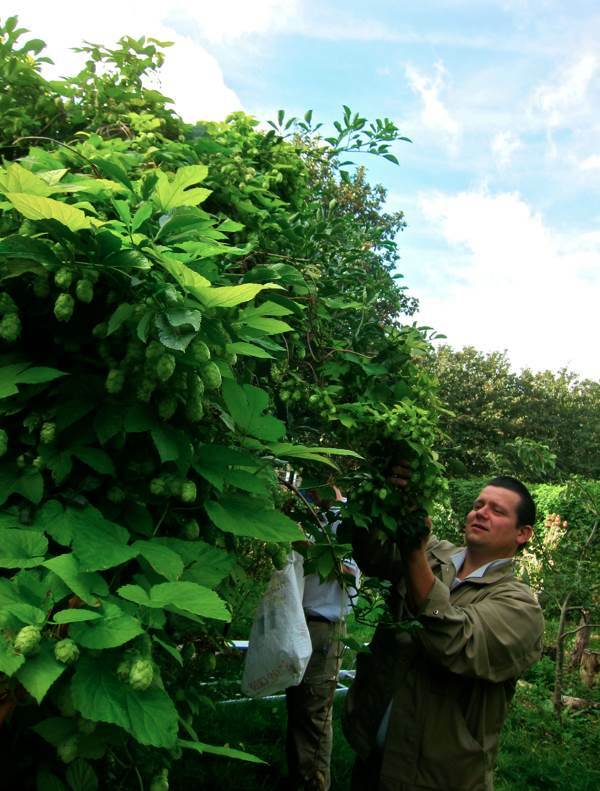 “My babies,” declared Ben in anticipation, rubbing his hands excitedly to see the hop flowers hanging there. But, after a few hours, we had barely filled even a fraction of our bag, such is the insubstantial nature of hop flowers when compressed, and it increased my respect for those who once picked hops for weeks on end, filling one sack after another. 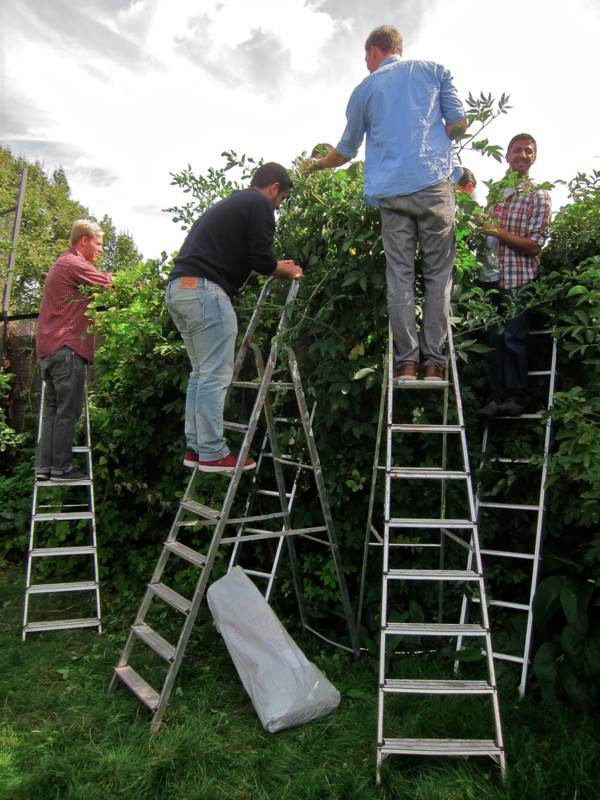 We climbed ladders to discover larger flowers up above and then enlisted assistance in the form of six eager young executives, who were at the farm on a day’s release from their City offices. 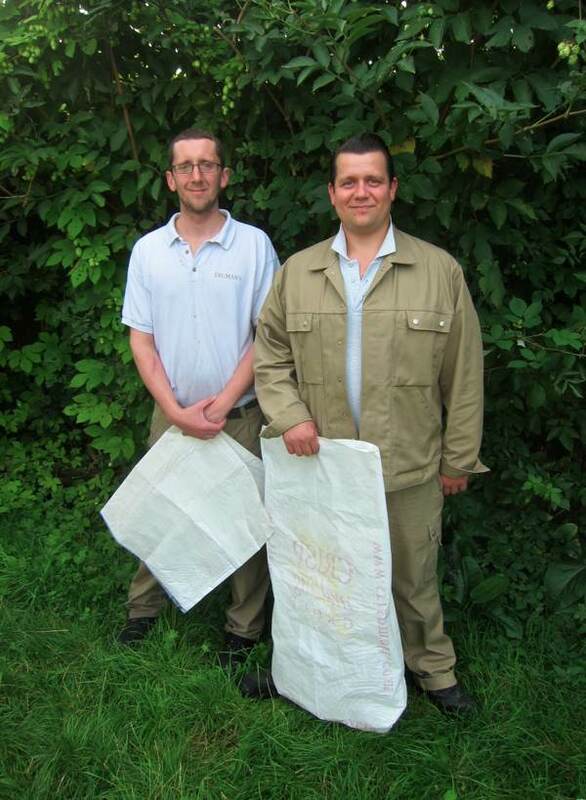 By the end of the morning, we had stripped the bines of flowers and filled one sack. 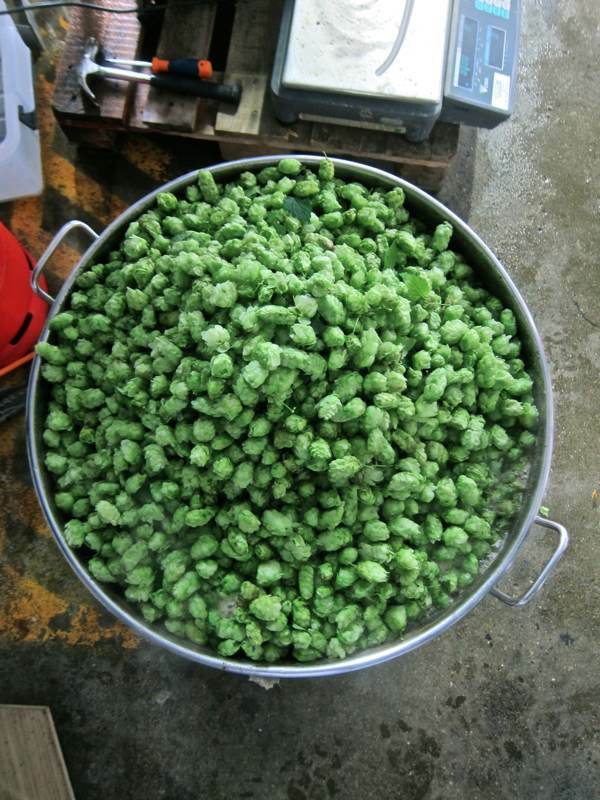 It was a modest haul, but we were proud to have gathered the first hop harvest in Spitalfields for many years. Over in Hackney Wick, at the new Truman Brewery, the day’s brew that Ben had set in motion before he came over to Spitalfields was well underway. Already, the pungent aroma of wort filled the air – this is the liquid created by soaking the mash of malted grain in hot water. 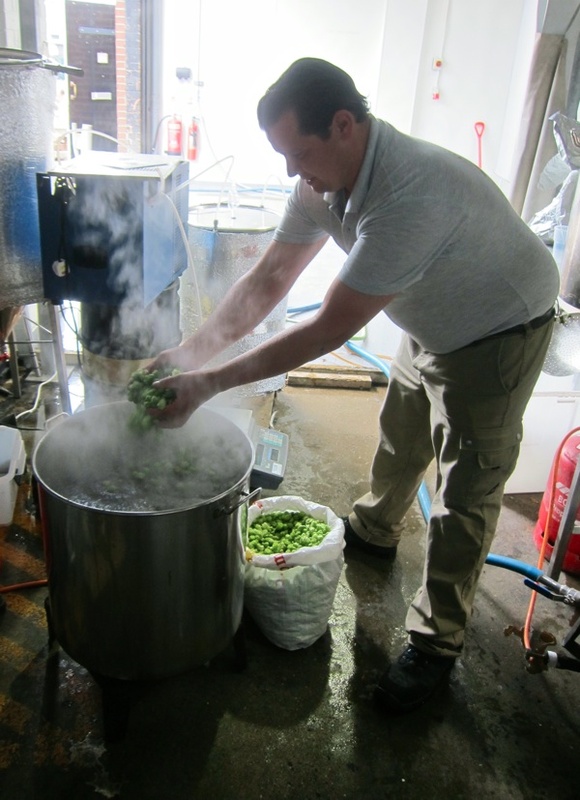 Ben added our sack of green Spitalfields hops to the end of the boil in a small copper and stirred them in for just a couple of minutes to allow the delicate fragrance to be absorbed. 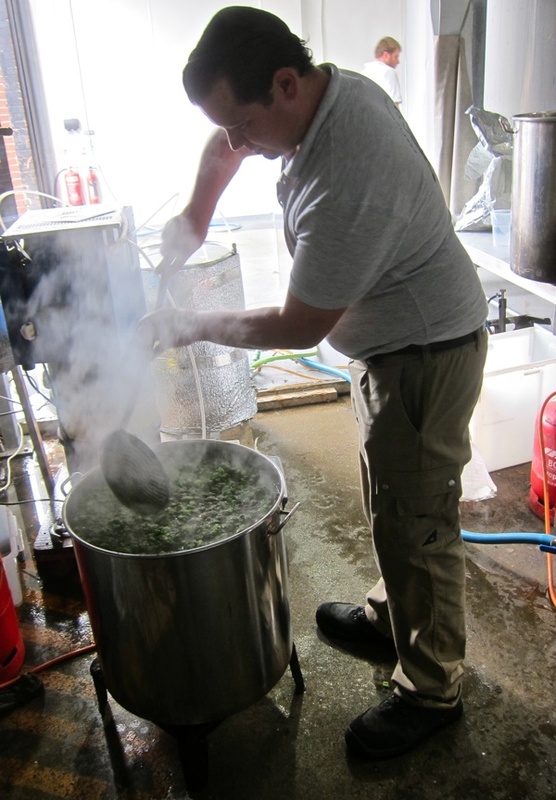 After letting it cool, he added the yeast and then the mixture would ferment for three days, before being put into kegs – and a fortnight later be ready to drink. We only made two kegs of beer with our sack of green hops and one will be given to the City Farm in return for the hops. The other keg of our ‘Bethnal Green Hop Ale’ will be served at the First Anniversary Party of the new Truman’s Brewery on Sunday 14th September from noon, when you are all invited to come and enjoy the rare opportunity to taste it for yourself. “A beer with a lovely story,” as Ben describes it. All are welcome to attend the First Anniversary Party for the new Truman’s Brewery from noon on Sunday 14th September in Hackney Wick and taste the Bethnal Green Hop Ale brewed from the hops picked at the City Farm. There will also be brewery tours and brass bands, among other attractions. 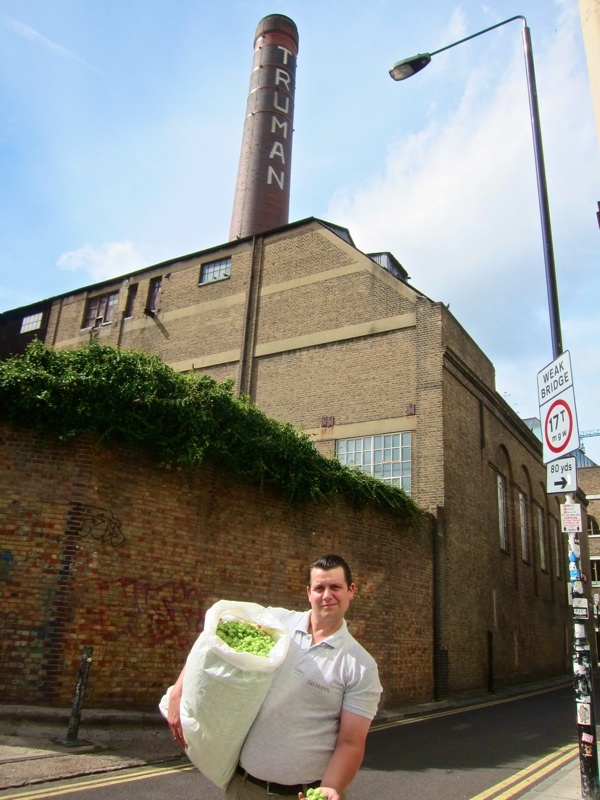 The hops from Spitalfields City Farm seem to be a high quality basic material for Truman’s Beer! Amazing what grows in central London! I can’t be there on Sept 14th – feel quite miffed about that actually. I would love to sample some of that beer. No doubt there will be another opportunity now Truman’s is back up and running. Another fascinating story to add to all the others which have added to my fund of knowledge since discovering this site. More thanks for a very grateful reader. Wow! I liked the beer and hops story so much I sent it to the Old Mill, Plainwell, Michigan, a micro-brewery.